Where to start? I’ve mentioned a few times over the last month that Brian and I have been doing Whole 30. As we’ve gone through the 30 days, I’ve been composing this blog post in my head the whole time (am I the only one who does that?) and let me tell you- the tone has changed more times than I can count. It has been up and down, a roller coaster of feeling good and feeling really bad. I’ve been excited to blog about my experience, but now that it’s ended I’m having a hard time wrapping it up in a way that makes sense. Let me just warn you up front that you might not want to read this while you eat, I’m probably going to share some information that qualifies as TMI. First, let’s backtrack to the why. I’ve always loved food. I’ve always been a live-to-eat kinda girl, rather than the other way around. I don’t think there’s anything wrong with that necessarily, but I have definitely placed some importance on food in the past when it didn’t belong there. I think I first heard about Whole 30 over a year ago. I saw Lucy post about her experience a little on Instagram, and I hopped over to her blog to read more about it. I was really intrigued, but I never thought I could do that. Like, ever. Then Anna posted about her experience. I think it was one of those things that you have to hear about several times for it to sink in, and after living with my parents for the last 6+ months I came to realize that cutting out gluten wasn’t that hard, which made cutting out other things seem more possible. We were coming off of a long, long, winter, and I was feeling especially sluggish. I was so ready for a change. Brian was feeling like he wanted to change his diet as well, so I did some more research, and started to feel like this might be the thing for us. This part is hard for me to write about because I hate to sound like a downer. On the Whole 30 website they explain that this, not eating the foods you love and drinking your coffee black, is not hard. Okay, I get that in the scheme of things it’s not that hard. But for me, this was hard. The first two weeks were pretty miserable. From day 3 through 14, every night after dinner I had really bad stomach pain. This ranged from me just wanting to lay down to being curled up on my bathroom floor wishing I would throw up (you feeling the TMI, yet?) I kind of “self-diagnosed” myself with acid reflux based on what I could find out online. I think my experience was definitely unusual- Brian was totally fine during this time (other than craving a lot of foods, obviously.) I was so miserable and willing to try anything that bought tea labeled GAS RELIEF in big letters and carried it around with me shamelessly while I shopped at Wegmans. That’s when I started to get really frustrated with the program in general, because after reading all these amazing testimonials, I started to feel like I was doing something wrong. I scoured the forum, and found all these “shoulds” that weren’t in the rules to being with. Things that are probably in the book that I, truthfully, didn’t read all the way. I’m not an all-or-nothing person, so it was annoying to read all these people talk about the “wrong” or “right” way to do this when I really believe that making any change in the right direction is progress, and therefore a good thing. The next day I ran the fastest 5k I’ve ran in the last 10 years. That pretty much sums up how the whole experience was for me- I’d feel horrible, and then a few hours later everything would be peachy. Overall, do I feel better now? Sure. I don’t feel as amazing as a lot of the accounts I read reported, but I do feel like I can focus better sometimes and I definitely sleep a lot better. I lost 7 pounds, which feels really good. I think doing this will help me make better eating choices moving forward, even though I won’t continue to eat exactly like this. Brian wants to continue to eat a lot like this, so I think he’ll be transitioning into a more paleo-inspired diet, and I’ll be adding some things back into my diet in moderation (especially potatoes, cheese, and some sugar.) I’ve also realized that a lot of the things I cut out are things that I don’t really want anymore. For example, sometimes wrapping your burger in lettuce legitimately tastes better than a bun. Food is such an emotional thing. It sounds silly, but it is. I knew that a lot of the things I ate before were out of habit, not necessarily because I loved them or because they were good for me. This challenged me to really think about everything I eat. And I have a whole new respect for people who make big decisions about their diet on a long-term basis and fight to stick to them every day. It’s hard from a social perspective to stick to your guns. Tomorrow I’m going to share more details about how we did Whole 30, along with a free menu planning printable and a lot of the recipes I found that I’ll definitely keep in our rotation! Have you ever done Whole 30, or are you considering it? I’d love to hear about it! I did the Whole 30 last year before my wedding. It IS rough. And everyone’s body is different, so we did a lot of tweaking of it as we went. For example, you’re supposed to limit fruit, but my husband bikes 20 miles a day and lifts weight at lunch–he nearly passed out a few times so we decided fruits could be unlimited and started doing smoothies for breakfast (a big no no because sugar) since that was right before he biked 10 miles to work. Made the whole thing much more pleasant too. I do a lot better without dairy and gluten in my diet, so while I don’t consider myself on a Paleo lifestyle, I don’t often do sugar/dairy/grains. But that’s just me–my husband has no problems with grains and everyone’s different. Thanks for sharing that post, Erin- I’ve been so focused on finishing that I haven’t thought much about the “reintroduction” part yet, so I’ll be interested to see what effect grains have on me! I haven’t done, but I’ve thought about it a few times! Like you, I have people around me doing it, but I haven’t taken the leap yet. But, we eat pretty DANG healthy… so I don’t know how big of a difference it would be for us. You could look into emeals.com, they have paleo and clean eating menu’s – delivered to your inbox every week. Makes life a whole lot simpler :) That helped my husband and I stay on track! I haven’t heard about that, I’ll have to check it out! If you already feel good about your diet, then it might not make a huge impact- I was just feeling like we needed a reset, and it definitely did that for us. We’ll see, I’m hoping that some of the changes we’ve made will stick long term! Your experience sounds a lot like mine (minus the sick feelings) – I felt like I was doing “everything right” but I never had that amazing transformation experience that so many of the people on the forums said they had in terms of getting all this energy or feeling “better” and seeing all kinds of benefits. I was glad I did it for the reasons you said though because I started thinking about why I was eating what I ate and how the foods I eat make me feel instead of just eating because that’s how I was used to eating. I do think it can be useful for people to learn about their bodies and their eating habits but it didn’t cause me to make any big changes to my diet/lifestyle in the long term. I haven’t done the Whole30, haven’t wanted to.. yet ; ) I was diagnosed with Celiac last year though and the first two weeks after giving up gluten I had horrible headaches (gluten addict?). All my favorite foods had gluten in them.. but it surprisingly wasn’t that hard to give up after the initial headaches. I felt so much better it almost didn’t matter. I’m sorry your experience was iffy, I’ve never heard of someone getting sick from it before. Looking forward to hearing about how you went about the Whole30! Thanks Caroline! I think my experience was definitely unusual… I’m feeling better now, so it’ll be interested to see how I feel as I reintroduce some of those foods back into my diet! Hey Kate, thanks for writing this! This was really interesting for me to read because I did a Whole30 last year, and I’m always super curious to hear how other people find it. Sorry to hear it made you sick!! I came at it from the perspective of someone who was already eating kind of Paleo-ish (no gluten, not too many grains, a moderate amount of cheese and cultured dairy, not a ton of sugar other than raw honey), but still had a bunch of health/digestive problems. I really hoped that doing a strict Whole30 for a month would be that magical reset button and make me feel a lot better. I didn’t find it too hard to stick to the Whole30 when I was eating at home, but it made socializing a bit of a nightmare. It’s hard to even order a salad out in a restaurant when the dressing probably has sugar in it! 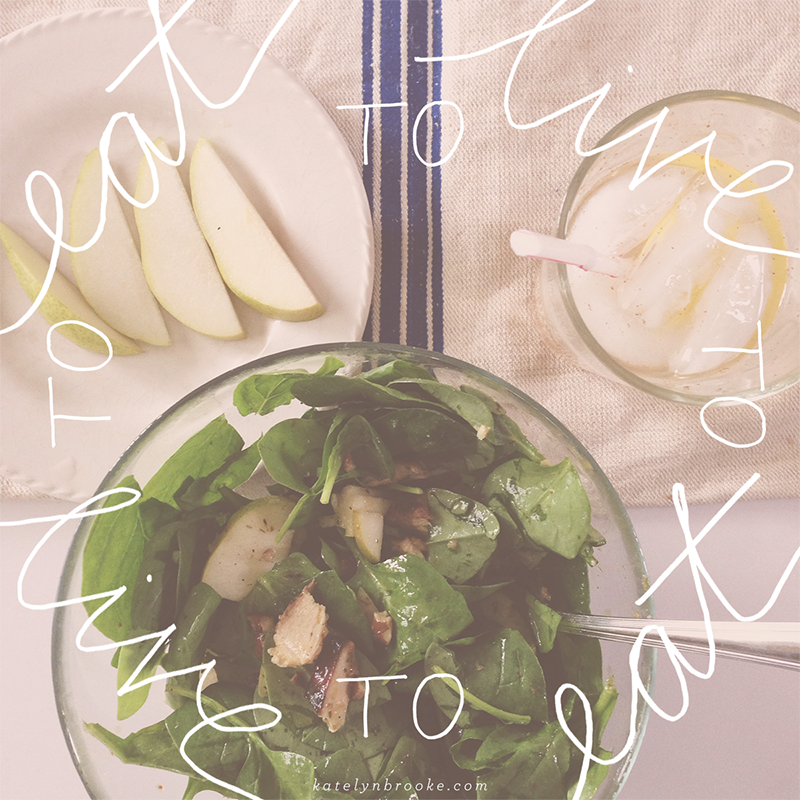 I found that I felt a little better after the Whole30, but it definitely wasn’t a miracle cure for me at all, and eating with that kind of strictness just isn’t sustainable in our culture. I think, if anything, it helped me to make choices with awareness. I choose to eat some dairy now, even though I know it’s not the best for me, but at least I know what I’m getting myself into. Re-introducing foods after a Whole30 is just as eye-opening as the Whole30 itself! Socializing is so tough on Whole 30! I found myself turning things down rather than just toughing it out- explaining the whole thing can be exhausting! I totally agree about it helping you make more informed choices, I’ll be interested to see how the “reintroduction” phase goes for us. I’m so happy you shared this! I considered doing this as well last month because I, too, have odd digestive issues, and I thought this would be a great reset button for my body. Instead of trying a Whole30 I tried 4-5 days of a raw diet, and I have to admit it was tough! I ended up giving in a few days in because I just felt like I needed a real MEAL ( even though my guy was happily willing to share that I was already eating the realest food I could ). It was weird. A raw diet sounds really hard! Why is this eating thing so tough?! Thanks Kory, hope you find something that works for you too!